Posted October 12, 2016 by Tony Jones & filed under Books. 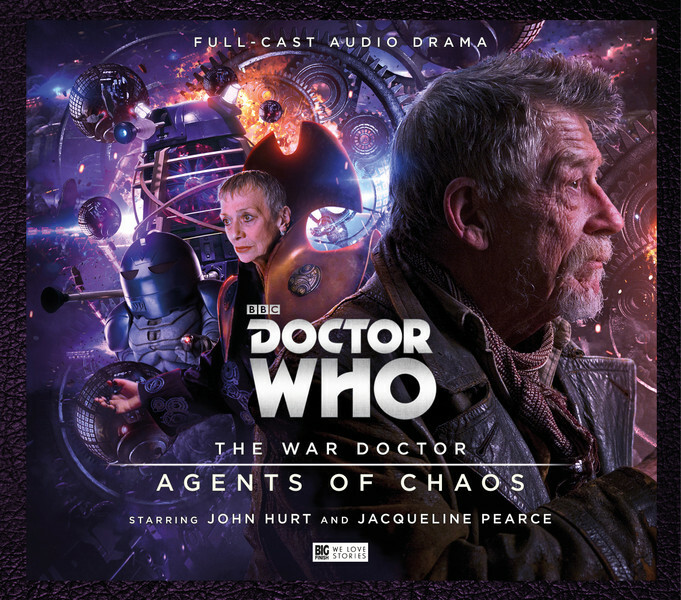 Agents of Chaos is the third, three-disc boxset in Big Finish’s War Doctor series, with John Hurt once more in role as the Doctor we never knew existed. This Doctor Who set takes the story deeper into the Time War and for the first time this version of the Doctor feels more capable of the grim decision making that prompted him to cast off the name Doctor and become the warrior. The three stories also feel like they occur in the middle of a war where the two enemies are becoming used to each other and are attempting guile and intrigue rather than the race to super-weapons we have had before. First up is David Llewellyn’s ‘The Shadow Vortex’. Set in 1961 East Berlin the Cold War is in full force and parallel to the East-West stand-off the War Doctor comes hunting Dalek Agent Lara Zannis played by Neve McIntosh, more familiar to Doctor Who fans as Madame Vastra. The story spins the machinations of the Dalek Time Strategist against the more prosaic world of the KGB and MI6. Supporting characters are well-realised, and if there is a complaint it is that the story is confined to a single disc. No such complaint with the next pair of stories, which form a linked pair. Andrew Smith sets out the scene in ‘The Eternity Cage’ and shows us why he should be considered the master of the Sontarans (of course played by Dan Starkey). Denied the chance to fight in the greatest battle of all, the Sontarans have lured the Time Lords and Daleks to Rovidia determined to take their place in the war. To the side of this the War Doctor has his own agenda – a rescue mission in the company of street urchin Kalan (Josh Bolt, who is starting out in his career and clearly has enormous potential). The story feels very much like a World War II movie and keeps the listener gripped to the end. Ken Bentley (who normally directs, but for this set Nick Briggs directs and plays the various Dalek roles) wrote the final piece of this set, ‘The Eye of Harmony’. Stakes are raised, traitors are revealed and Cardinal Ollistra (Jacqueline Pearce) plays a major part as does Heleyna (Honeysuckle Weeks). With such an iconic title, the threat to Gallifrey is about to turn on a knife-edge and the War Doctor seems helpless to intervene, trapped in a wrecked battle TARDIS adrift in the Vortex. It’s all the ingredients of a blockbuster movie in one single disc’s worth of adventure. As a set it’s a great listen and waiting for the final act in February seems a cruelty, as does confirmation that no more are planned. This won’t answer those fans who still feel John Hurt’s character is an unnecessary addition to canon, but they should still be able to enjoy the entertainment. Released in October 2016 by Big Finish. You mean to say that there are actually people who feel that way? If they can’t accept the sight of JOHN FREAKING HURT AS DOCTOR WHO then I really don’t know what to say.